The PCE-IC1 temperature calibrator is an easy to use infrared calibration system for calibrating infrared thermometers in laboratories or in situ. 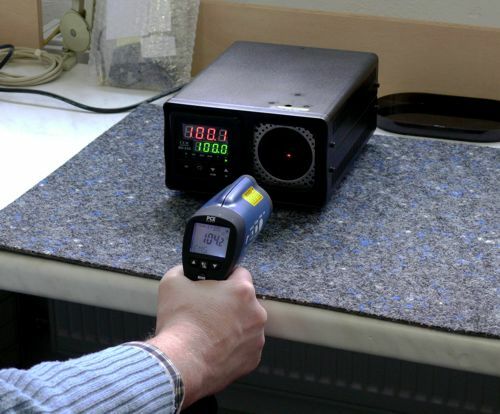 The temperature calibrator's thermal block, or black body, is situated at the front of the device and has a diameter of 58mm, which serves as the source of radiation for calibrating pyrometers. This temperature calibrator also allows for the use of the thermal block in adverse conditions, including infrared thermometers that do not have any direct relation to their defined measurement point. 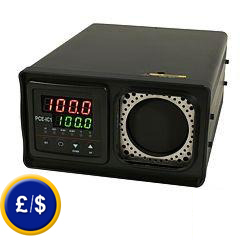 The temperature calibrator's control unit is easy to use and has a display that shows the nominal value and real value of the temperature being verified. An integrated cooling unit allows for temperatures to be raised or lowered quickly. This temperature calibrator is ideal for verifying and calibrating infrared thermometers. It ensures the highest accuracy and repeatability of infrared thermometers and eliminates erroneous measurements in advance. If you wish to see other calibrators, click here. with this calibrator as you can see in the upper image. 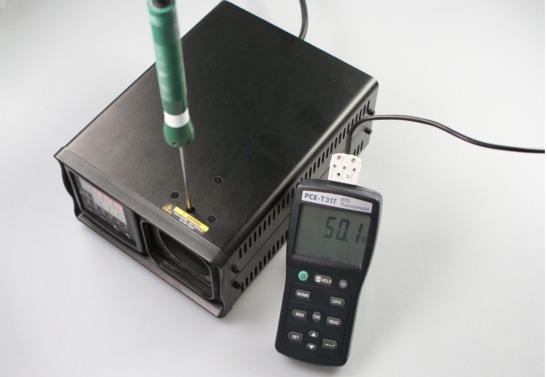 calibrate a thermometer that uses temperature probes with this calibrator. There are other calibrator types to calibrate voltage, pulses, current, resistance and frequency signals. However, there are other calibrators without these properties. Depending on your own requirements, you may need diverse devices or calibrator models. If you need to verify some or all the properties previously mentioned, you should buy a multifunction calibrator. This multifunction calibrator will allow you to measure some different values, since it is generally able to display these values simultaneously. High quality calibrators are the ideal instrument to measure emission of voltage, current, resistance, pulses, frequency signals as well as for the simulation and measurement of resistance thermometer and thermo-elements. This last characteristic is also described in the device as "TC measurement and simulation". The resistance thermometer is called RTD. Apart form the multifunction calibrator, there are other calibrator types such as: pressure calibrators, sound calibrators, process and block calibrators. This calibrator is the most common type. Calibration: The control of measurement magnitudes the temperature calibrator without intervention in the measurement system, or the determination of the systematic display deviation in relation to the real value of the measuring magnitude. This means that it is up to the user to check and control the interval between calibrations. We recommend that this interval between calibrations should be between 1 and 3 years. We can also offer our expert advice to solve any questionss relating to the process of establishing a calibration interval.